The origin of the Japanese or Chabo bantam dates back several centuries to when their prime purpose was to serve as living ornaments in the beautifully landscaped gardens of the wealthy. Use – Primarily for ornamentain and showing. make excellent pets. Japanese are a true bantam which means they do nt have large fowl counterparts. With very distinctive short legs and long straight vertical tail feathers with a relatively large comb and wings that are held low, touching the ground. Eggs: 100 – 160 Can be white to cream or very pale brown. 23 to 31 grams in weight. Colours – These are the ones I know or have seen myself - Black Tailed White, Black Tailed Buff, Buff Columbian, White, Black, Birchen Grey, Silver Grey, Dark Grey, Millers Grey, Mottled Black, Mottled Blue, Mottled Red, Blue, Lavender, Cuckoo, Red, Tri-coloured, Wheaten Bred, Partridge Bred, Brown Red, Blue Red, Silver and Gold Duckwing. Remember not all colours appear in the breed standards in every country. Quaint, unique, beautiful and aristocratic are four words often used to describe Japanese Bantams. They all fall short of the mark. Japanese Bantams are everything these four words imply, and more. In Japanese society it has been said that the breed was considered a sacred bird. 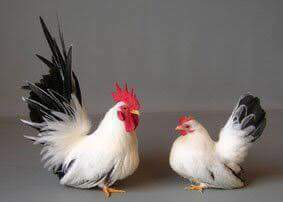 The Japanese Bantam is an old and honored breed with no counterpart in large fowl, nor does it have any resemblance to any other breed of Bantams. They are real show birds and go back a long way in history. It is thought that they first arrived in Japan from China in the early 1600’s when they started to appear in Japanese paintings. In Japan, they are called “Chabo” which means “bantam” or “dwarf” in Japanese but is also the old Japaneses name for South East Asia. They are thought to have reached the UK in the 1860’s and the first Japanese Bantam Club was formed at the Crystal Palace (London) show on 12th November 1912. The club didn’t have any activity during the two World Wars but resumed activities afterwards. The club was briefly amalgamated to the Frizzle club in 1946 but this didn’t last for long. The present Japanese Bantam Club of Great Britain was formed in 1961. How big are japanese bantams? Not very big at all, 8 ( Hen) to 12 ( male) inches including the fancy tail feathers. Weight: Cockerel: 510 – 600g, Hen: 400 – 510g. The short legs means you can keep them safely in your garden and they will not do anywhere near the damage of their larger brethren. Five to six years the same as other chickens. Maybe longe in ideal circumstances. These chickens have been known to live for up to 13 years with proper care. I would not recommended them as a beginners bird. A true Bantam that is easy to tame but suffers with a lethal gene combination that causes 25% of chicks to be unable to hatch. Not a hardy bird, can be good fliers. Breeding for good type (especially short legs and correct tail angle) is not easy. So except for the fact that 1 egg in 4 will not hatch even if it is fertile and provided you have happy well looked after birds with no fertility issues they are as easy to breed as any other bantam. Their outstanding features are the very short, clean legs and their tail carriage. A Japanese bantam's long tail is carried high and well forward, in a manner that is normally called squirrel-tailed and is a disqualification in most breeds. They have an evenly serrated single comb, rather large on the males, and the face and ear lobes of the birds should be bright red.apparently infertile birds may need their vent feathers trimming to facilitate mating. Are japanese bantams noisy? especially the cockerels? No. Their size limits the amount of noise they can make. They were bred to be garden ornaments after all. Nor is the crow long like a large fowl. it can be little more than a squeak! Are they friendly? Yes , very. Most bantams are more friendly than large fowl. it may be because Japanese bantams have been selected for type for more than 400 years. They are great personalities and easily tamed. The Japanese is an ideal bird to run on delicate lawns and gardens, as its short legs preclude it from doing much damage to the ground. Are they good layers ? Not really 2 to 3 eggs a week at most in their prime. maybe a maximum of 160 in their first year if you have a good season. Do japanese bantams go broody easily? Hens make a good broody and can make good mothers. Six eggs is the most than can realiatically cover. What do they eat? Exactly the same as you feed your normal hens except they need a slightly smaller feed particle size. try a layers mash if you cannot get small pelets or use crushed or rolled grains to break them up. I find mine do much better with a little extra protein in the diet, around 16%.They do like to free range. Where can I get hold of them? See our directory of breeders or join a facebook group in your area. Buy with caution as breeders tend to sell the birds they would not keep for breeding or showing themselves!Birds are sometimes very closely related if they have been line or carelessly bred. Have you enjoyed this webpage? please share.